Perhaps you will have watched The Devil Wears Prada. Über-fashionista Miranda Priestly, one of Meryl Streep’s most implacable creations, stands at a charity benefit whilst the great and the good come to pay her homage. Beforehand, her assistants Andrea Sachs and Emily Charlton are given books of contacts and photographs. Their task: to learn faces and facts about them. When anyone approaches Miranda they must whisper discretely in her ear the identities and salient nuggets of information so that the great lady herself can appear encyclopaedic in her knowledge of every acquaintance. But senior assistant Emily has a stinking cold and forgets her lines. It is the new girl, Andrea, who comes up with the goods. And proves herself the ultimate accessory for a VIP: a thinking aide. Old-style heralds were not just advisors to the powerful. Once they crossed bloody battlefields. These days we might call them diplomats. 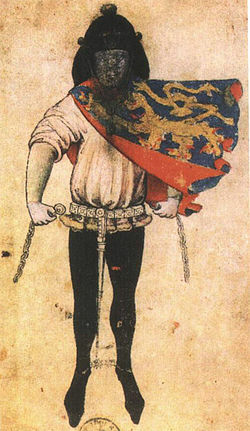 Monarchs and noblemen would hire them to take messages, wearing a tabard bearing their master’s coat of arms. They recognised the person to whom they would deliver by their blazonry; the colours, patterns and symbols on their coats of arms. Shields bearing arms were not much in evidence at Hastings in 1066; but a little over 100 years later Richard I was sporting a lion. And already we are into the strange linguistic world of blazonry: for it is a lion ramping towards the sinister side: or standing and pawing to the left. It is startling how much detail can be conveyed by a coat of arms. A plain background is less elevated than a patterned background (or ‘fur’ background). A bewildering assortment of variations to the fur theme existed: black with white spots, gold with white spots, white with black spots, gold with black spots. Different lines represented different aspects of a warrior’s character – a wavy line symbolised sea, an embattled line (which looks like battlements) for a fortified town. Pictures: don’t get me started. The symbols refined a warrior’s on-battlefield persona to reflect him exactly, from the bat which symbolised the powers of darkness, to the bay leaf which represented poets and the victorious. A brief look at A Roll Of Arms of the Reign of Edward II is a dizzying introduction to identifying the powerful in those days. And heralds knew it all. 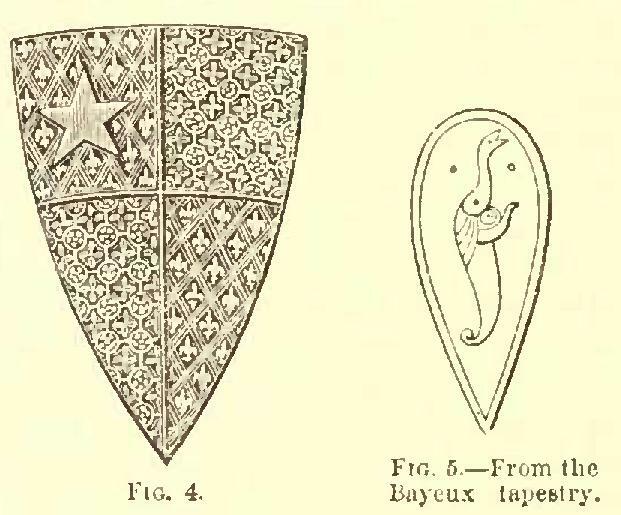 The French and English heralds, it is said, stood on a hill above Agincourt and watched the whole thing, identifying every warrior though his coat of arms. In those far off days, in the art of blazonry, colours told the shade of a man’s heart. Black was sable-black, says Brewer’s Dictionary of Phrase and Fable. It represented prudence and wisdom and constancy. Blue represented the warrior known for his chastity, his loyalty and fidelity. Green revealed the nobleman of love, joy and abundance; purple denoted he of temperance. Blazonry has two reds. How they told them apart on a bloody battlefield I will never know. Gules was the red of a traditional piece of fur which sat at the throat. It is sometime called ruby-red, or Mars-red. It means the arms-bearer is magnanimous. The second red is sanguine, a reddish brown colour of the chalk for which it is named. It is said to be the colour of dried blood, and a man with it on his shield has great fortitude. The bearer of a shield with white denotes the innocent and pure; yellow, faith, constancy and wisdom and glory. It does not need much imagination to see how vital every detail of this knowledge was. One slip and the wrong person gets the message. The life of both herald and recipient, at the very least, were at stake. And all this vast array of knowledge was stored in in one place: the herald’s head. It must have made people easier to read. Perhaps we should colour code our key players today. Posted in Quirks of HistoryTagged battlefield, blazonry, coats of arms, colours, heraldry, symbolismBookmark the permalink. What a fascinating post – love the term blazonry! Many of our key players would need one colour on the front and another on the back. Wouldn’t that help things along a little? Oh wow! Kate does it again, more snippets to send one off lurking in foreign spots for more knowledge. No wonder Joseph had such problems with his brothers, too many colors. Fascinating look at the history of colour, Kate! Blazonry is an amazing business, Tom. Another very interesting post Kate. Fascinating! I enjoyed trying to guess the inns of the Knights of Rhodes from their coat of arms. I never knew the history behind coats of arms. Certainly Miranda had one? She seemed like the type who would go in for that sort of thing. I love all the symbolism. In another lifetime, I’ll delve into the minutiae—must make a note. It is definitely something for a long airplane journey, or a time when you are going to be waiting around. But the stories which bubble up when you start to investigate…. This was so interesting and informative today, Kate. I had an inkling about the symbolism, but apparently not much given the detail that you’ve gone into:) So interesting how they communicated.. kind of like today’s “gravatar” in technology? What a fantastic thought, Barbara! Yes, an avatar is just the same: a visual representation to aid recognition! It really would be helpful if people were color coded today. Heraldry and blazonry are so wild, with the vast amount of symbolism involved. Love it. It simply remains for you to click the link and design your own, Weebles…it would have to have weebles on it, naturally. Heraldry. Always a fascinating topic. We’ve adopted an unofficial form of it for our political parties — Blue ground with donkeys and red ground with elephants. Rarely rampant however; both look a little silly that way. I know, but think of the yarning possibilities, IE!! Nice post. People were very protective of their coats of arms. In 1385 in two knights, Richard Baron Scrope and Sir Robert Grosvenor turned up for service with the army of Richard II… and discovered they were wearing the same coat of arms! Cue general outrage and squabbling on a scale that would have even impressed Miranda Priestly. After 5 years of legal wrangling Scrope, who somehow persuaded everyone that his family had worn the arms (‘azure, a bend or’ ie a yellow diagonal band on a blue background) since the Norman Conquest, won the case. Grosvenor gave up the yellow band and replaced it with a yellow wheatsheaf which is still used by his descendant trhe Duke of Westminster. General Jules, what a fabulous story- proof, too, that the Norman Conquest included coats of arms. I would have loved to have been there to see the faces of the two noblemen in question. Thank so much for coming along, for reading and for such a fabulous comment. Alive and well are plays of color in parks and playgrounds — shades and hues imbued with intricate relations of meanings. Hard part is that no key or legend could keep up! What is the figure on #5 above? A sea critter or a turtle? Fascinating info on colors. The Scots’ plaids told quite a bit about their “families” as well. Hmmm – must pull out the old family coat of arms and have another look. Yellow background and grappling hooks, from memory. While I can confirm that yellow meant generosity and elevation of mind I have drawn a blank on the hooks, Wonderingpilgrim. Sure they’re not lilies? Could be lilies. Grappling hooks sound more exciting – for storming the battlements? Reminds me of the Irish sweaters worn by fisherman. Each pattern different so that, if the unthinkable happened, the family could identify their dear departed by the knit of his kit. I never thought of that angle, Nancy! What an excellent point. If you couldn’t get a signal you’d probably be pushing up daisies. This fascinating piece has me wondering why I’ve never wondered about these things – you writing makes me think outside my rather worn-out square, Kate. Not worn out, just waiting 🙂 Thank you Bluebee. You say the loveliest things. All those colours had lovely complimentary meanings. Which ones did they leave to describe ‘A rotten horrible cruel uncultured tyrannical boor … with BO’ – ?